We return to Portugal for our 9th tournament in the Algarve on the 6th June weekend. The tournament will have both an "Open Age" tournament and a "Veterans" tournament all on the same day and at the same venue. The Algarve has been one of our most popular events over the years and was included in our very first tour season back in 2007. Since then the beaches, hotel pool, Albufeira strip and of course our football venue has been a well trodden stamping ground for touring teams and stag weekends alike. Click on this link for all the information. If you are looking for a long weekend where you can chill out by the pool, on the Mallorca beaches either side of a first class 5-a-side football tournament before heading out on the town with the great nightlife that Magaluf and Palma Nova have to offer then the Mallorca Tournament is YOUR tournament. The Mallorca Tournament made a sensational debut in 2011. Since then, the 2012, 2013 and 2014 tournaments became our fastest-selling tournament in each of the last three years. It is therefore no surprise that, without a moment's hesitation, Mallorca was straight back in the schedule for 2015. . If a long weekend is not long enough then we have some 7 night week specials to turn it into a real lads holiday. Click here for the Mallorca Tournament 2015 details. Interest in our Barcelona Fives tournaments is always high and we are looking forward to another great day in the home of, arguably, Europe's most attractive football team when we return in October 2015. Why not combine your tour with a trip to the Camp Nou? Always book as soon as you can to get the best flight deals. Sit down with a blank piece of paper and think of all the legends and stars of the world game that have applied their trade in Barcelona. You can probably note down a good couple of dozen without thinking - Cruyff, Guardiola, Koeman, Laudrup, Ronaldo, Romario, Stoichkov, Maradona, Ronaldo, Figo, Luis Enrique, Rivaldo, Ronaldinho, Deco, Giuly, Eto'o, Marquez, Lineker, Puyol, Thuram, Zambrotta, Fabregas, Messi, Henry, Xavi, Iniesta, Neymar, Suarez.....Hleb (whoops)....the list could go on. Join the legends of the game and ply your football trade in one of the most vibrant cities in Europe!vThis tournament will be our 11th in Barcelona - we hope you can join us. Following over 20 successful tournaments in Albufeira (Algarve), Barcelona, Mallorca and Valencia over the last few years it is clear to see you love your football set against a backdrop of sun, beach, sea, good climate and not to mention a cracking nightlife. It is therefore no surprise to see Lisbon become our latest sun destination on the tournament calendar and become our 5th destination on the Iberian peninsular. Can you become winners of the eurofootballfives.com Lisbon Tournament? Bratislava was welcomed to the eurofootballfives.com party as a brand new destination in 2014 and it's straight back into the schedules for 2015. Following extensive experience in Budapest, Krakow and Prague it is obvious it was only a matter of time before Bratislava earned its chance to shine in our schedules. Bratislava has a great nightlife and plenty of options for your nights out - from pubs for a few cheeky ones to good bars/clubs to party the whole night away. There is something for everyone. Nightlife is cheap compared to Western European standards so you get great value. Beyond this Bratislava is a great looking city (not just the stunning women) with plenty to offer from a sightseeing perspective - a beautiful medieval city with winding narrow streets and castle overlooking the Danube. The two main squares (Hlavne namestie and Hviezdoslavovo namestie) are becoming a hive of activity with café's, bars and restaurants. We had a cracking debut in Berlin back in 2012 and since then the tournament has gone from strength to strength. The tournament is firmly established in our calendar as we relish in our annual jaunt to Germany. Is there a better time to go to Germany? The Bundesliga is riding a crest of a wave, Die Mannschaft are the current World Cup champions and Berlin is simply an incredible city to visit. Why not join us there in 2015? The 20th June is the date for your diary! Budapest has proven to be a hugely popular destination on our circuit attracting teams from Argentina, Belarus, the Czech Republic, England, France, Germany, Hungary, Ireland, Romania and Sweden since its inception in 2011. The Budapest nightlife is one of the best in Europe and this beautiful city is a fantastic setting for you culture vultures by day. Budapest is located outside the eurozone and uses the Forint so works out relatively cheap compared to the Pound or the Euro so more beers for your buck! What are you waiting for? Email us on info@eurofootballfives.com to take your place at the tournament. Click here for the 2015 Budapest Fives tournament details. Athletico Do Hollande created history and became the second most successful team in eurofootballfives.com football when they won their third tournament. Having won the 2010 and 2011 Algarve Open titles they added the 2014 Amsterdam Fives trophy to their cabinet. Many congratulations to them. Melee FC were the runners-up and they were also second in the 2013 Barcelona Fives - maybe third time lucky for them at their next tournament appearance. In the Plate competition there was success for St Paul's College Old Boys as they played out a thrilling Final against Pajero FC with a penalty shoot-out needed to decide the winners. Personal honours went to Craig Harrison with 11 goals in 7 games - a fine achievement as he also celebrated his stag weekend. For full details of the 2014 Amsterdam Fives click here. With teams from England, France, Germany and Ireland assembled to do battle it was the local Berlin based team, Hasanheide Hotspur, who ensured that the trophy would stay in Berlin. There was rumours that a bigger and more important trophy came to Berlin in July but we think the World Cup was clearly second to the Berlin Fives in most German hearts. There was success for France in the top goalscorer category as David Teixeira won the award with 8 goals. Deportivo Dooradoyle of Ireland missed out on a second Plate victory as they lost out on penalties to another local team - Scandittack FC. With German-based teams winning the Cup and the Plate, FC Auslander were denied a hat-trick in the Wooden Spoon by losing out on Golden Goal to Fred's Fairys for the most coveted *cough* prize of the day. We can't wait to get to Berlin in 2015. Check out the 2014 report here to see what it's all about. Our third tournament of the year and our third different nationality of winner! Following success for Spain and Belarus in the 2014 season it was Portugal that added their name to the list of successful nations. This was a rare feat in the Algarve as the Algarve Open has run since 2009 without a home success - until this year! We witnessed an all-Portugal Cup Final as Stand Cristina met Water Boy and emerged victorious 2-1. The Plate competition also saw Portuguese success as 11 Esperancas Faz Clube saw off the English challenge of Far Out FC, 1-0. So with a Portuguese double in the team competitions it was a travelling player who took the individual award as Joe Bardwell of Far Out FC won the Top Goalscorer award with 8 goals on the day. He was second top goalscorer in the 2013 Algarve Open with 6 goals and also the winner of the Top Goalscorer award at the 2012 Berlin Fives. We'd like to thank all teams for participating and look forward to seeing you again soon. For full details of the 2014 Algarve Open click here. From the opener in Valencia the eurofootballfives.com 2014 tour moved on to Budapest and we seemed to take the glorious Spanish sun with us. We were treated to a glorious weekend - perfect for football and perfect for some chilled outdoor drinking on the days in the build-up to the event. On the pitch we had 24 teams assembled from 5 different nations to compete for the ultimate title. In the 81st and final game it was CIS Committee of Belarus who emerged victorious over Argentina (Arg). It was the second tournament of the year that had been decided on penalties and the second consecutive year in Budapest that penalties were needed to decide our champions. There was also glory for FC Radbroke in the Plate (their 3rd eurofootballfives success) as Budapest Celtic Tigers were Runners-Up for the third time in 4 years (although 2011 and 2012 was in the Cup). Contejus Hurricanes added the 2014 Budapest Fives Trophy to the 2012 Algarve Open Plate in their European "cabinet". Cava Sundays picked up runners-up medals in the Trophy on debut. Individual honours went to Dydynho of The A Team who became only the second player in eurofootballfives.com history to win a second Top Goalscorer award in only his second tournament. Click here for the full 2014 Budapest Fives Tour Report. On a weekend when the temperatures were around the 26-30 degrees mark the travelling teams from England, Ireland and Hungary were treated to some great weather that had been missing for months in Northern Europe. On the day it was the Spanish who tasted victory for the first time in Valencia since 2010 when Futbol City took the crown. They defeated Penethinaikos in a sensational final that went all the way to penalties after a thrilling 3-3 draw. In the Plate, Saipan FC broke their duck to claim their first winners trophy as they went on a superb run of form in the latter half of the tournament which culminated in them beating Budapest Celtic Tigers in the Final. The individual honours on the day went to Daniel Kerr of HMNB Portsmouth who rattled in 12 goals in 6 games to bag the Golden Boot award. Barcelona has always been a popular destination for a football tour and it's obvious to see why - stunning city, iconic football city, the Camp Nou, good weather, the beaches and of course - the Barcelona Fives. Our 2013 tournament was our largest ever with 25-teams and Barcelona is immediately confirmed in 2014 - it will be our 10th tournament in Barcelona. The date for your diary is the 18th Octber - for full details see here. After another hugely successful visit to the German capital we are delighted to confirm the 2014 Berlin Fives will take place on the 21st June. The 2012 and 2013 tournaments have been nothing short of superb and we can't wait to go back in 2014. 44 teams have enjoyed the Berlin Fives over the last two years and next year's event is expected to be just as popular...especially as the tournament coincides with the World Cup. Play football, watch football, drink beer - perfect weekend! After the veritable delights of Lisbon 2013 the eurofootballfives.com Veterans Tournament takes flight to the stunning shores of sunny Mallorca for 2014. The 2014 Amsterdam Fives is the sixth eurofootballfives tournament in the Dutch capital and this great city. Amsterdam is one of the "must do" football tour destinations famed for its nightlife and only a short flight from the UK and accessible from all parts of Europe. The Amsterdam Fives has seen teams compete from Bulgaria, Czech Rep, England, Holland, Ireland, Italy, Northern Ireland, Scotland and Wales over the years. Do you fancy your chances of taking glory in the home of 'Total Football'? We started our 2013 season back in April with a Portuguese hat-trick of titles in the 2013 Lisbon Tournament. Teams from Portugal won the Cup, the Plate and the Veterans competitions. We ended our season in Barcelona in October and we had another hat-trick - for Ireland. Teams from Ireland (Northern and Republic) won the Cup, the Plate and the Trophy competitions. It was a great day with 25 teams, 72 games, 5 nations and all wrapped up in a great tour weekend in this most iconic of cities. Our teams enjoyed the Barcelona nightlife, the Camp Nou, a La Liga match at Espanyol and of course our tournament. We hope you can join us next year for this great lads' weekend. Budapest Celtic Lions claimed their first eurofootballfives.com victory in Krakow as they came from behind to beat a strong A-Team (Fra) 2-1 in the Cup Final. It was the second victory for Hungary in 11 months after FC Miracle's win at the 2012 Valencia Fives. Celtic had finished Runners-Up twice in our Final's so it was a case of third time lucky and it was much deserved. The Plate Final was a dramatic contest as Awiw also came from behind - from 3-0 down - against Saga Louts to equalise in the final minute and then take the glory on penalties. Following a superb tournament in Prague 2012 we were honoured to be asked again to host the JNJ Euro Soccer Tournament. Budapest was the stage in 2013 and it was a fantastic event in a fantastic city. There was victory for JNJ Russia A as they took on the title from JNJ Croatia last year. JNJ High Wycombe A had to settle for Runners-Up medals for the second year in a row. In the Plate competition, Prague winners Slavoj Consumer of the Czech Republic retained their title with a win in Budapest (on penalties) over Fi Tighe FC. The top goalscorer award went to Artem Khodas with 13 goals - 5 more than anyone else on the day. Well done to him. A big thank you to everyone who attended a fantastic day of tournament action! Inter Women cruised to their second eurofootballfives.com victory in Mallorca. Having won the 2011 Amsterdam Fives they went out on penalties in the Quarter-Finals in Mallorca last year. Determined to put that right they looked the best team on the day from start to finish as they wrapped up the title 4-0 in the Cup Final. They became the 9th team in eurofootballfives.com history to win multiple tournaments. Olympic Phil Babb have 4 wins and there is now a clutch of 8 teams sitting on 2 victories. In the Plate competition, Have Ago Heroes claimed their first win by defeating Cheesecake FC 3-0 in the Final. The Top Goalscorer was Daniel Powell who now had a hat-trick of personal gongs to add today's trophy to the 2011 Amsterdam Fives and 2012 Mallorca Tournament awards. See how it all went down on this link. After one of the highest quality tournaments we have staged it was ABC United of Romania who claimed the winners trophy and medals after a superb victory over France's Luminy Wolves. Team Geek put a slow start behind them to go on a tournament winning run of form to claim the Plate title. They defeated Saipan FC of Ireland who came so close to a eurofootballfives.com title but were Runners-Up for their third successive final. For the full run down of results click here. FC Radbroke claimed glory for the 2nd time in eurofootballfives.com action as they defeated all the competition to add the Algarve Open title to the Prague Masters title they collected in 2011. In the Czech Republic 2 years ago they defeated Deportivo (Cze) 1-0 and it was the same scoreline in the Algarve as they defeated CFC Paris of France. It was the second year in a row that CFC Paris collected Runners-Up medals as they also lost to Mandem United in 2012. In the Plate competition, local team Water Boy of Portugal came from behind to beat United Colours of Benetton of the Netherlands 2-1. Norton Old Boys claimed the Wooden Spoon to add to their Plate victory in the 2012 Mallorca Tournament. Mike Brandon of FC Radbroke was the tournament top goalscorer with 9 goals to his name. For the full tournament report click here. Grant Thornton claimed their first victory in eurofootballfives.com action and the second for France (after Luminy Wolves in Barcelona in 2008). It was a great result against a Skidmarks team in the Cup Final who were looking to make it 3 wins in 3 tournaments. They would have been only the second team in eurofootballfives.com history to do so. In the Plate competition there was victory for local side Son Gual of Spain who defeated England's Coverton Road 1-0 in the Final. Our Top Goalscorer, as it often does, came from the winning team with Cedric Castarede of Grant Thornton picking up the trophy with 7 goals for the day. For full details of the action click here. The 2013 Lisbon Tournament kicked off our season in style as eurofootballfives marked it's debut in the Portuguese capital. Following 7 successful years in the Algarve it seemed a no brainer to add Lisbon to our schedule. What an amazing city Lisbon is! It certainly won't be our last in this great destination. On the pitch, with teams from England, Hungary, Ireland and Portugal, it was the home nation who were celebrating with a clean sweep of the team trophies - Cup, Plate + Veterans! Click here for the full tournament review. Mallorca has proved so popular for our 2013 season we have added an extra date - so, if you are/were unable to join us in June you can now join us in May. The new date is Saturday the 4th May which is a UK bank holiday weekend so if you are reading this in the UK why stay at home in a traffic jam with awful weather when you could be enjoying the sun, beaches and nightlife of sunny Mallorca. Click here for tournament details. May the 4th be with you. We are delighted to announce the dates of our latest Barcelona 5-a-side football tournament - 19th October 2013. If you are looking for the ultimate football tour surely it has to be to the home of the widely accepted best team in world football at present. To help launch the tournament we have a special offer whereby we can give you a free tour of one of the world's most famous stadia - the Nou Camp. When Fabio Capello was in the big chair, before the clamours for Harry Redknapp and the appointment of Roy Hodgson - the Football Association copied eurofootballfives.com and chosen Hutnik Krakow as their Krakow base for Euro 2012. In 2007, eurofootballfives first ever tournament was held at Hutnik Krakow with the inaugural Krakow Trophy. Seven Krakow tournaments later and we are still holding our events at Hutnik Krakow but by the time the 2013 Krakow Trophy comes around the complex will have been played on by Rooney, Lampard, Gerrard, Walcott, Hart and alike. You too can add your name to the list of players who have played there by signing up to our 2013 event. The Algarve Open has come and gone for another season and as we wave a fond farewell to the Portugal sun we look forward to our next Algarve tournament on the 18th May 2013. In 2012 ManDem United won the coveted trophy beating teams from England, France, Hungary, Ireland and Portugal. Our Algarve tournament is always popular so get in touch as soon as you can and book your place. 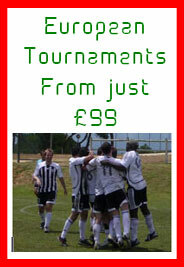 The tournament will be played on the 18th May 2013 - book early to guarantee availability. With the 2012 Budapest Fives concluded, which saw victory for Romania in the Cup and Hungary in Plate, we have launched the 2013 Budapest Fives immediately. This tournament made it's debut in 2011 and has proved hugely successful with 38 teams competing over the last two seasons. Many of our regular clients have described the Budapest nightlife as the best in Europe and with the Hungarian capital proving great value for money with food/beer prices you are sure to have an unbelievable tour at the Budapest Fives. The tournament will be played on the 11th May 2013 - book early to guarantee availability. A brand new destination and a brand new tournament for 2012 - The Berlin Fives. Often requested by our clients and always popular with anyone who's toured there, visited or been on a stag weekend to this great city. It was only a matter of time before Berlin joined the eurofootballfives.com party. Just chatting to clients on 2011 tournaments about the imminent arrival of Berlin has created quite a buzz and we had a long list of interested parties who pre-requested tournament information. It's bound to be a popular event as Berlin promises to make a glorious debut for us in Germany. We hope you can join us in the German party capital! The Mallorca Tournament enters its 2nd year in 2012 after a triumphant debut in 2011. No sooner had the 2011 event been put to bed then we were booking up for 2012. Do you like playing your football in the sun? Of course you do. Would you like to have a few beers in one of Europe's party capitals? Of course you would. Before and after the tournament do you fancy some beach/pool action? Most definitely. It sounds like the Mallorca tournament is just the place for you for your end of season tour, stag weekend or lads holiday. The tournament is on the 16th June- we hope you can join us! Email us on info@eurofootballfives.com for details.